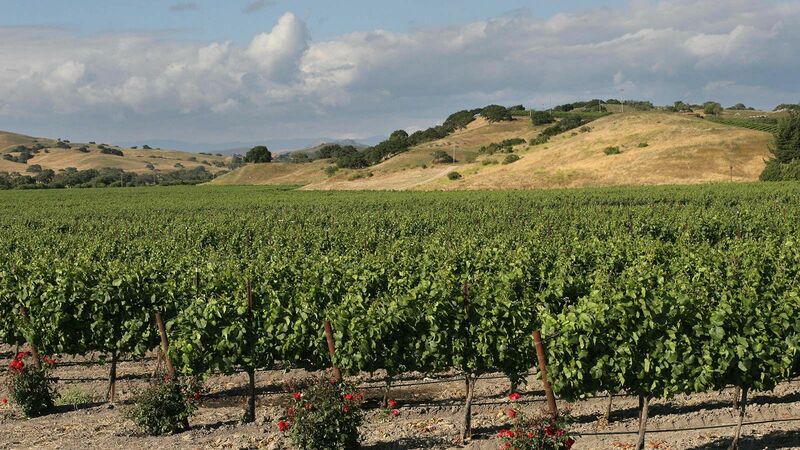 Why people are calling this Santa Ynez Valley destination "Little Los Angeles." Calling Los Alamos “sleepy” might be the understatement of the year. Bell Street, the main drag of this onetime stagecoach stop on the northern end of California’s Santa Ynez Valley, is a whopping seven blocks long — and we’re talking short blocks. The low-slung buildings lining Bell Street look like relics of the Old West, and the folks who live there are the no-fuss sort who will lay down posters on hot asphalt when there’s road work being done so you and your friend can cross the street without ruining your shoes (true story). So why should you make the two and a half hour drive north from Los Angeles, past tony Santa Barbara and the tasting room-lined, so-perfect-it’s-practically-a-movie-set town of Los Olivos? Well, with its decidedly chill vibe and population of less than 2,000, Los Alamos is the Solange to Los Olivos’s Beyoncé: it doesn’t need a ton of bells and whistles to be cool. It just is. Plus, a spate of recent openings makes this Santa Barbara wine country enclave even more worthy of a weekend adventure. One such reason is the Skyview Motel, hidden on a vineyard-dotted hill above town. The 1959 build reopened in April after two years of extensive renovations; Nomada Hotel Group, its new owners, brought a fresh look to the 33 guestrooms, sunny pool deck, and restaurant, while maintaining the iconic yellow-and-black “Motel” sign and keeping the property's mid-century bones intact. 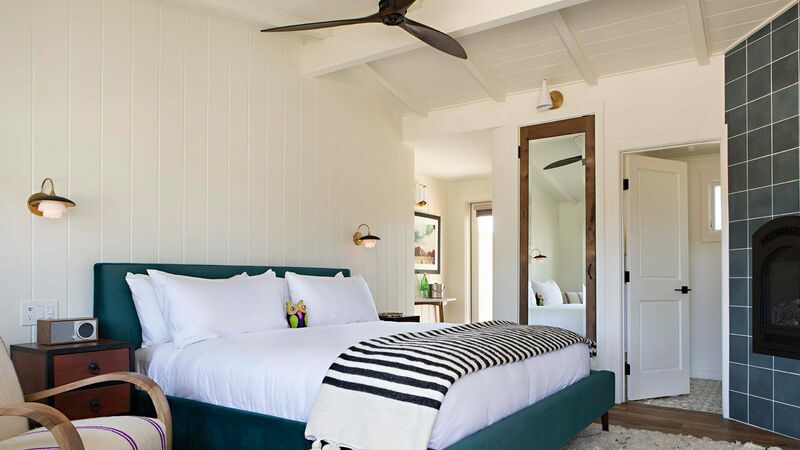 The overall feel is Western chic meets desert hideaway: guest rooms have been outfitted with white paneled walls and dark hardwood floors, as well as luxurious touches like cowhide rugs, farmhouse sinks, indoor fireplaces, and one-of-a-kind leather and hand-woven chairs from Morocco. Even the vintage-style motel room keys (no key cards here, folks) beckon to the property’s past. Bask in the sun on the deck of the heated pool, and order herb-infused cocktails and snacks from the 1960s-inspired New American restaurant Norman next door — named for Mr. Bates himself, and decked out with a baby grand piano and curved, patterned banquettes. A pair of original cactus-shaped pillars and forest green doors with a Midcentury golden starburst detail beckon to its entrance, while inside, guests share dishes like local trout with preserved lemon brown butter. Other elements add to the hotel’s relaxed charm: In the morning, you can take your coffee (in a classic “We’re Here to Serve You” paper cup, no less) and a pastry on the deck just off the main office, overlooking the hills and ranches below. The property is dotted with fire pits (some rooms have their own private ones as well), perfect for evening hangs with a glass of wine. A steep, palm-tree lined driveway makes for a dramatic entrance — and there’s also a small fleet of tangerine-hued Linus bikes all outfitted with baskets at the ready to ride down the hill into town. Take your Linus straight to Bell’s, opened in March by husband-and-wife duo (and Per Se alums) Gregory and Daisy Ryan (she’s a Santa Ynez Valley native). The couple took over what used to be the Bell Street Farm market, making some design updates — adding a leather-and-wood banquette, for example — but leaving intact many of the design elements of the original Bank of Italy building, like the pressed tin ceiling and tiled floors, complete with tracks from when the space used to be a biker bar. 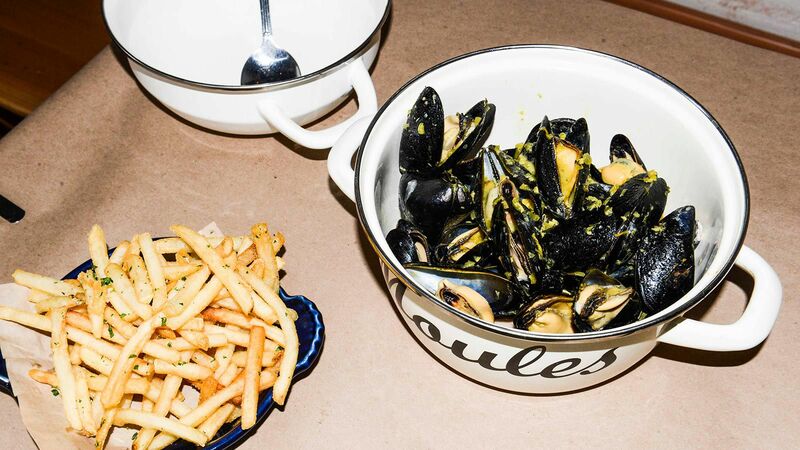 As a nod to France's kindred spirit wine towns, like Lyon, the menu is stocked with French bistro fare: wild Burgundy snails with garlic butter, moules frites, gnocchi with sauce fonduta, and the like. At lunchtime, you’ll find a rustic egg salad sandwich slathered with tomato jam, and bright salads made with local greens. Locals know a delicious secret: the popular caper-studded steak tartare isn’t on the lunch menu, but you can ask for it on a sandwich and the kitchen will happily oblige. Just halfway down the block, you’ll find the first-ever tasting room for Lo-Fi Wines, which opened its doors in June. Owners and lifelong friends Craig Winchester and Mike Roth both live in town, and they're keeping it local: some of the wine grapes are grown in Roth’s yard, and others at one of the vineyards at the Skyview. The tasting menus are imprinted with the label’s mantra: “Wine is like life and music.” That couldn’t be truer here. Winchester and Roth may invite you to pick a record from their growing vinyl collection to play on the tasting room's resident turntable, a perfect soundtrack for sampling the winery’s easy-drinking rosés, Gamays and Cab Francs (at $15 for a tasting of five or six wines). As you listen to Jerry Jeff Walker or Minutemen, check out the rotating art on display for sale. For an alfresco tasting experience, head over to Bodega. Los Alamos has garnered the moniker “Little LA” of late, and that may be most apparent at this effortlessly chic new open-air wine and beer garden. 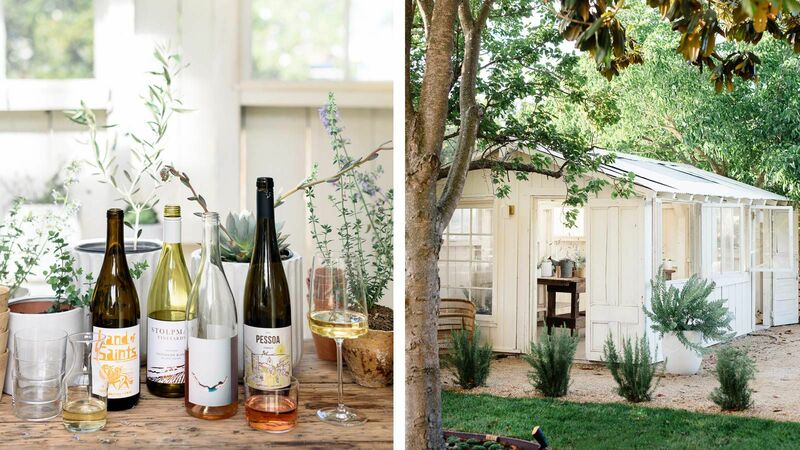 Take a peek into the white-washed greenhouse, filled with pottery and succulents for sale, before camping out in the tree-lined courtyard for a glass orange Jolie-Laide Pinot Gris (or Bodega’s own Little LA IPA). There’s also a bocce court and fire pit, as well as a small, smartly-appointed shop stocked with handmade candles and artisanal sea salt. In mid-August, a 1920s-era farmhouse on property will be opening as an Airbnb. 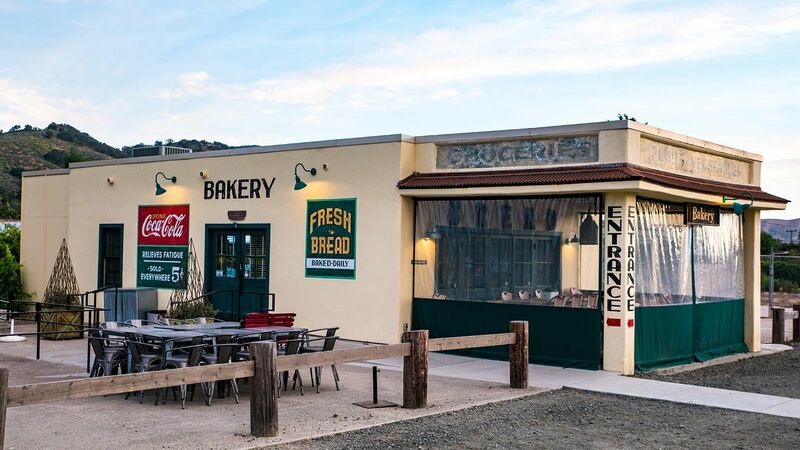 Of course, no visit to Los Alamos would be complete without a visit to some of the town’s local haunts, like Bob’s Well Bread Bakery — a staple since 2014. Owner and former Sony marketing exec Bob Oswaks is a stickler for details; it shows in the bakery’s carefully prepared loaves of artisan bread, baked in a custom-made stone-deck oven, as well as classic French-style pastries like flaky pain au chocolat and kouign amann covered in a shatteringly hard sugar crust. In the morning, enjoy your coffee with folksy breakfast options like an “egg in a frame” — an over-easy farm egg and goat cheese inside the bakery’s pain de mie, topped with blistered cherry tomatoes and a smattering of salt — or their take on beans on toast, piled high with house-made baked beans, roasted tomatoes, and a snappy Toulouse sausage. A note for Bob’s lovers: The bakery is planning to open a second location in Ballard, California. Other must-visit spots include Full of Life Flatbread, pulling flatbread pizzas from its massive, 20-ton hearth — smack-dab in the middle of the dining room — since 2003. Try the restaurant’s dead-simple take on French carrot salad, called the Lil’ Alamos Salad, or one of the thin, bubbling pies topped with ingredients that could easily have been pulled from the planter boxes adjacent to the restaurant (a personal favorite is the Central Coast Sausage pie, made the with restaurant’s own pork, blue agave, and fennel sausage). 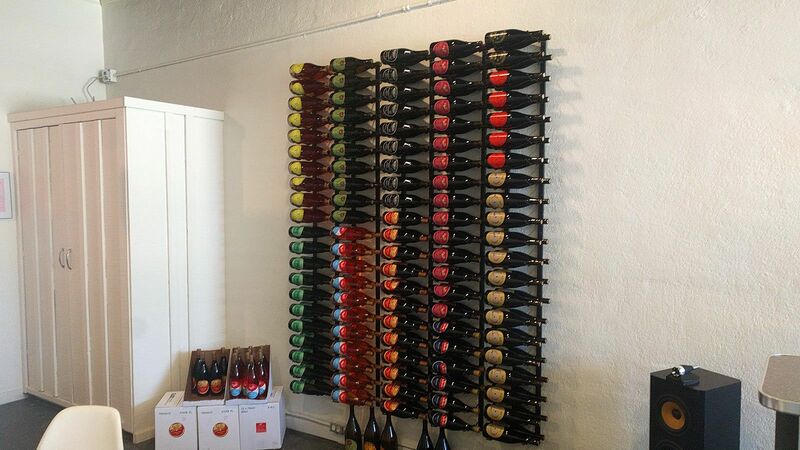 Just a block away is Casa Dumetz, a sunny tasting room with a breezy Mediterranean feel. There, owner and winemaker Sonja Magdevski pours Rhone varietals, funky ciders, and her line of Feminist Party wines, a single GSM blend she created to pay homage to the women (and men) who have helped her along her winemaking journey. If you need a break from eating and drinking, peruse the antiques and home goods at Sisters Gift and Home, where a handful of vendors sell vintage glassware, china, birdcages, books, and more. And for a truly trippy shopping experience, wander through the seemingly never-ending Depot Antique Mall. The rooms of this former Pacific Coast Railway station are chockablock full of antiques in all categories and from various periods — and there’s even a pub inside if you find yourself in need of a beer. And at night, feel like a cowboy at the 1880 Union Saloon, a favorite stop of stagecoach charlies and other freewheeling folk since the late 19th century. It only makes sense that it’s done up in true Western style, with dark wood, old-timey chandeliers, horseshoes affixed to the walls, and an imposing moose head that watches over the mirror-backed bar. Take your signature whiskey cocktail back to the plush red pool table, or listen to the regular live music programming; a frequent presence is one-man band Terry Lawless, who’s played with U2, Bruce Springsteen, Jackson Browne, and many others. Los Alamos is still a bit of a cowpoke town, of course, and that's part of the appeal — but with new openings, classic hangouts, and a prime wine country location, now is the time to visit.